People crossing between in Montana and Canada have twice as many options for crossing the border than people crossing the border in Arizona. Yet, standing at two border communities, Sweet Grass, Mont./Coutts, Alberta, along the northern border, and Nogales, Ariz./Nogales, Sonora (Ambos Nogales), both areas along the 110th meridian, one notices a stark contrast in the level of infrastructure. While, the northern border between Montana and Alberta includes more ports of entry than the Arizona/Sonora border, the southern border is far more militarized. If U.S. President Donald Trump has his way, more militarization (read: another wall) will be in store for the residents of Ambos Nogales. Yet, during the campaign, then Republican candidate Trump, said that he was not interested in building a wall along the northern border. The almost two-thousand mile border between the United States and Mexico is the longest border between a developed country and a developing country. But, the length of the northern border is the longest in the world, transpiring 5,525 miles. This includes the more than 1,500 mile boundary between Alaska and Canada. Honing in on the two border communities of Ambos Nogales (the community of both Nogales) and Sweet Grass, Mont./Coutts, Alberta, visitors can see the striking differences in the measures that the U.S. government has taken to “increase security” in both regions of the borders. Plastic markers and a dirt road separate Sweet Grass, Mont., and Coutts, Alberta. Along the Montana/Alberta border, the small towns of Sweet Grass, Mont. 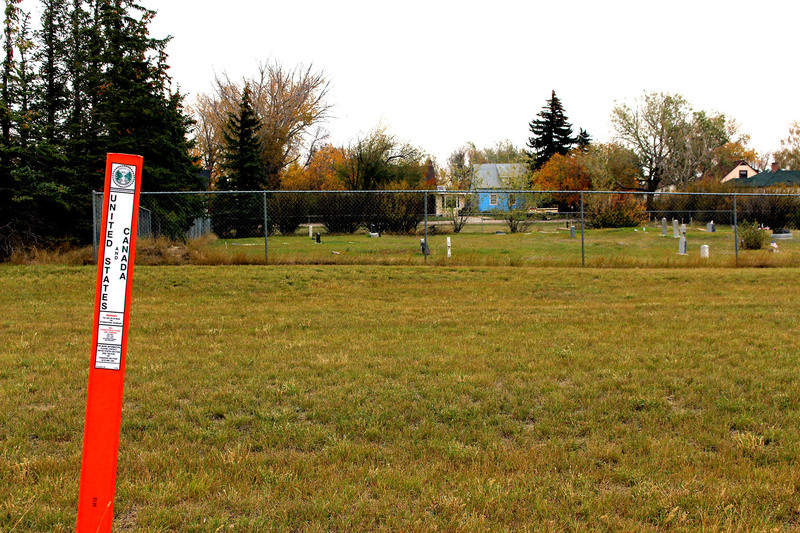 and Coutts, Alberta are separated by a wide, dirt road, which is dotted with thinly cut, flat, orange-colored plastic stakes that sway in the chilly fall wind. The only fence in the area is a chain link backstop on a baseball diamond on the Canadian side. In contrast, along the southern border in Nogales, Ariz., and Nogales, Sonora, a fairly-new 18-to-30-foot steel-fence, that cost taxpayers approximately $10.4 million, divides Ambos Nogales into two separate communities. The newer 2011 steel-fence, which some call a wall, replaced the 1990s erected “landing mat” that made it difficult for border agents and borderlanders to see through. Although border infrastructure remains much more visible on the southern border, U.S. officials say that the threat is the same. Even though the infrastructure dividing Canada and the U.S. is not as ever present as along the southern border, the citizens in Coutts, Alberta, say border security has increased. 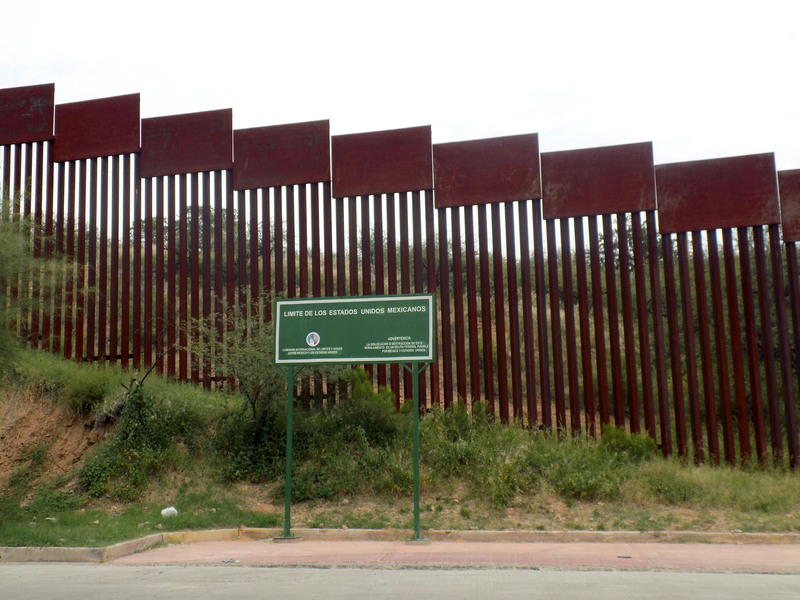 A 20-foot wall separates Nogales, Ariz., and Nogales, Sonora. The Sweet Grass, Mont., port of entry is located in the 456 mile-long Havre Sector of the U.S. Border Patrol. As of September 2015, the Havre Sector employed 167 Border Patrol agents to guard the area, according to U.S. Border Patrol’s Sector Profile Report for fiscal year 2015. The Nogales, Arizona station, on the other hand, falls within the much smaller Tucson Sector. This sector is just over half the size of the Havre sector, with 262 miles of shared boundary with Mexico, yet, the Tucson Sector employed far more agents. According to CBP data, 3,991 agents patrolled the Tucson Sector in September 2015, and that number grew to a force of about 4,200 agents by May 2016. The latest renovations to the Sweet Grass Port, 12 years ago, included the construction of a U.S.-Canada joint-facility . Both the United States Customs and Border Protection (CBP) and the Canada Border Services Agency (CBSA) work out of the facility. Several factors led to the shared building. As Anderson explains, the security services in both countries have the same mandate to protect their citizens, and working a bit closer together in one facility allowed them to enhance their border crossing. While this joint-facility brings the United States and Canada to work closer together, U.S. authorities say some divisions were necessary. Those shared areas include conference rooms, lockers, training areas, and lunchrooms. Completed in September 2004, the facility cost taxpayers approximately $26.5 million (USD). As Furnare explains, the Sweet Grass port typically has three primary lanes open for privately-owned vehicles, however on busy days, one of the cargo lanes may be used for non-commercial vehicles to ease the flow of traffic. Last year, about 280,000 passenger vehicles went through the Sweetgrass Port of Entry, which accounted for about 40 percent of its traffic, according to Furnare. Traffic at the ports of entry in Ambos Nogales is much higher than in Sweet Grass, Mont./Coutts, Alberta. In 2014, more than 3.2 million personal vehicles went north through border crossings in Nogales, Ariz. That same year, more than 300,000 commercial trucks came into the United States through Nogales ports. The high level of commercial traffic coming through Ambos Nogales led to a recent expansion of the Mariposa port of entry. The 2014 renovation, which included the opening of 12 primary lanes and 24 secondary inspection stations, cost approximately $187 million, according to the GSA. Despite the devaluing of the Mexican peso, business in Nogales, Ariz., depends heavily on Mexican shoppers coming across to make purchases. Likewise, residents along the northern border community of Sweet Grass, Mont./Coutts, Alberta are economically dependent on their cross-national neighbors. With Trump stepping into the White House, many northern and southern borderlanders are concerned that more militarization could hurt their communities that are already struggling economically. Felix says he remains optimistic that President Trump will not be able to build a wall during a four-year term. Hear from residents living on the northern and southern borders along the 110th meridian.